Bay View is a residential community in the southeastern section of the City of Milwaukee. Its borders are Lake Michigan (east), Morgan Avenue (south), Kinnickinnic River/Chase Avenue (west) and the Kinnickinnic River north of Becher Street (north). Bay View has its own school, post office, library, historical society, community center, park, newspaper, neighborhood association, and arts guild; numerous businesses also include Bay View in their name. Bay View has such strong community pride that the news media routinely refers to it by name. This sensibility, in turn, gives some the mistaken belief that Bay View is still one of Milwaukee’s suburbs. Ward’s company town was laid out south of the steel mill with north-south streets aligned parallel to the northwest-southeast trend of Lake Michigan. The perpendicularly aligned east-west streets actually run southwest-northeast. 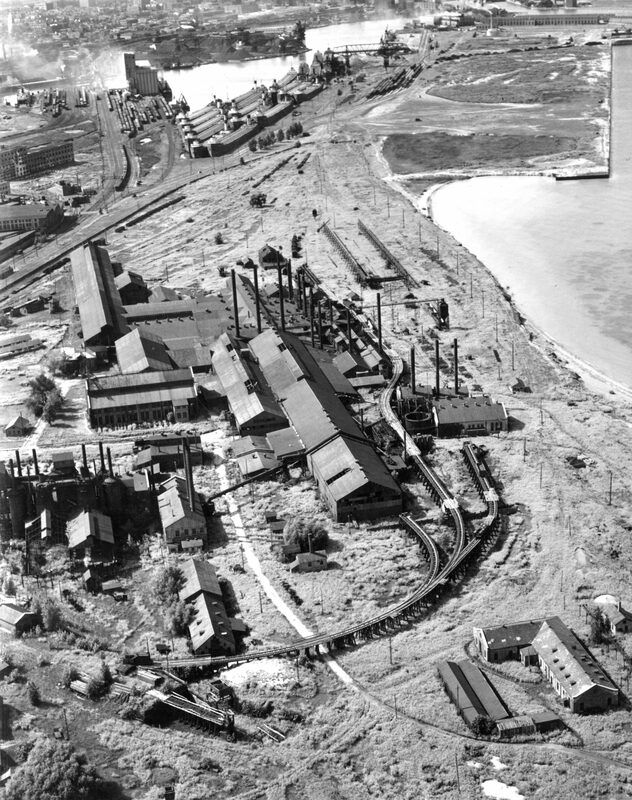 Ward then named many of the streets for steel mill employees (Potter, Clement, and Russell) and bodies of water (Superior, Ontario, and St. Clair). In time, numerous multi-point intersections were formed by the merger of Ward’s streets, the City of Milwaukee’s standard north-south grid system, and meandering pioneer roads such as Kinnickinnic Avenue and Chase Avenue. This explains the challenge of navigating Bay View’s streets. Bay View incorporated as a village in 1879. But its inability to provide streetlights, sewers, and other essential services, combined with the 1886 Bay View Tragedy, convinced residents to join the City of Milwaukee in 1887. Even so, Bay View retained its name and continued as a self-sufficient community. 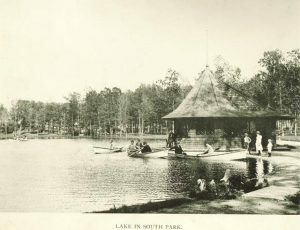 In fact, it actually grew, as the name extended to the City of Milwaukee north of the old village and to adjacent Town of Lake land that subsequently became part of Milwaukee. In the early 1870s, Beulah Brinton established a free community library and the first social center in the United States in her Victorian Gothic home, where she provided music, games, books, and taught homemaking skills and English. Across from the Brinton House is the Pryor Avenue well, which originally provided fire protection for a school once located nearby. 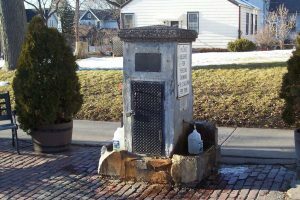 Today, people come from all over Milwaukee to obtain fresh spring water. 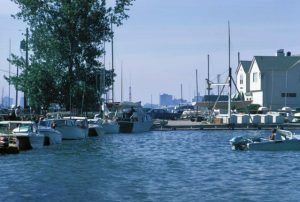 Although Bay View is predominantly white, its mostly liberal residents have much in common with Milwaukee’s Riverwest and Walker’s Point neighborhoods, both of which welcome residents without regard to sexual preference, race, or ethnicity. In the twenty-first century, Bay View experienced a renaissance, with its new restaurants and new businesses. Community events such as the Bay View Bash, South Shore Frolics (established 1949), South Shore Farmers’ Market, Chill on the Hill, and Humboldt Park Fourth of July celebration attract people from all over Milwaukee. ^ Ron Winkler, Bay View (Charleston, SC: Arcadia Publishing, 2011), 21; John Gurda, The Making of Milwaukee, 3rd edition (Milwaukee: Milwaukee County Historical Society, 2006) 114; Bernhard C. Korn, The Story of Bay View (Milwaukee: Milwaukee County Historical Society, 1980), 52-53; Frederick I. Olson. “Suburbanization: The Bay View and Residential Models,” in Trading Post to Metropolis: Milwaukee County’s First 150 Years (Milwaukee: Milwaukee County Historical Society, 1987), 30. ^ Korn, The Story of Bay View, 53; Olson, “Suburbanization,” 30. ^ Gurda, The Making of Milwaukee, 115. ^ Winkler, Bay View, 21. ^ Winkler, Bay View, 9. ^ Gurda, The Making of Milwaukee, 116; Olson. “Suburbanization,” 31. ^ Winkler, Bay View , 21; Gurda, The Making of Milwaukee, 164. ^ Winkler, Bay View, 8; Korn, The Story of Bay View, 95-96. ^ Winkler, Bay View, 8. ^ Korn, The Story of Bay View, 71-72; Olson, “Suburbanization,” 31. ^ Winkler, Bay View, 8; Korn, The Story of Bay View, 114; Olson, “Suburbanization,” 31. ^ Korn, The Story of Bay View, 117-119. Olson. “Suburbanization,” 31. ^ “Social Center Honors Woman,” Milwaukee Journal, August 3, 1924, part seven; UWM School of Architecture and Urban Planning, Historic Preservation Institute, “Beulah Brinton House Preservation Study Report” (July 2011), p. 18, last accessed August 24, 2017. ^ Winkler, Bay View, 48. Gurda, John. “A Future Cast in Iron.” In The Making of Milwaukee, 3rd edition, 112-116. Milwaukee: Milwaukee County Historical Society, 2006. Korn, Bernhard C. The Story of Bay View. Milwaukee: Milwaukee County Historical Society, 1980. Olson, Frederick I. “Suburbanization: The Bay View and Residential Models.” In Trading Post to Metropolis: Milwaukee County’s First 150 Years, 30-38. Milwaukee: Milwaukee County Historical Society, 1987. Winkler, Ron. Bay View. Charleston, SC: Arcadia Publishing, 2011. Winkler, Ron. Milwaukee’s Town of Lake. Charleston, SC: Arcadia Publishing, 2013.